In Addition Family Farm Supply has a full line of complete feeds for Cattle, Sheep, Swine, Goats and Horses in Bloomington Indiana and surrounding areas. Since no single feeding program works for every animal, Family Farm Supply offers a complete line of feed and minerals for every stage of your animal’s life. Some of our brands include Umbarger Show Feed, Mix 30 and Vitaferm. 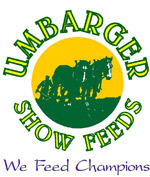 Umbarger Show Feeds is a fourth generation family owned and operated business located in central Indiana, and has been in business for over 70 years. Umbarger Show Feeds has been specially formulated by Showmen for Showmen. they understand the importance of nutrition and winning results. their expertise in Steam Flaked grains and our dedication to the show ring sets us apart from the competition. Umbarger Show feeds focuses on providing the highest quality products along with the service you desire. Please take a look at some of the thousands of winners that have already joined us on "The Road to the Winners Circle". No matter what species of livestock you are exhibiting, Umbarger Show Feeds should be your only choice for winning results. Mix 30 Liquid Feed is a high energy protein supplement created from a combination of corn and soy based co-products. This proprietary blend of ingredients results in a palatable, consistent, nutrient-rich product that supplies a judicious combination of both protein and energy for all ruminent diets. Family Farm Supply, also handles mineral tubs, salt blocks, supplements, and feed ingredients for your everyday mixing needs.